Modelled on Mercedes-Benzs Modular Front Architecture (MFA) platformthe other cars made on this platform are the A-Class, the B-Class and the CLA-Classthe GLA-Class is aimed at affluent, first-time luxury SUV/crossover buyers. In fact, the GLA, with its coup-like design, is a clear breakaway from the old mans car image that had developed for some of the companys cars. The front gets a large two-slat grille finished in chromethe three-pointed star is prominently placed on the grilleand the A-Class inspired headlamps with daytime running lights and projector headlamps look snazzy. The GLA is not a tall car and this is apparent once you look at it from the sides, but the large wheels and a 183-mm ground clearance give it decent road presence and make it look mature. The rear section, again, looks smartLED tail-lamps, wide fenders and twin-exhaust pipes look neat. Yes, the GLA doesnt get the imposing, butch looks of the M-Class, but remember that the M-Class is a true SUV but the GLA is a crossover. If you get such an arresting exterior, can the interior be far behind Enter the cabin and, if you have already been inside the A-Class, you know what I have written in the next line. The centrally-mounted screen, three air-conditioning vents in the middle and two on the sides, three-spoke multi-function steering wheel, all lend class to the GLAs cabin. Gear selector lever, like in most Mercedes cars, is on the steering column, on the right side. What adds to the beauty is a huge panoramic dual-sunroof that gives the cabin an airy feelthe roof closes automatically when it senses that it is raining. The GLA will come with three interior colour packagesan all-black version, an all-beige version, and a black-beige combination interior option. But because the GLA is not a large car, the cabin is not really voluminous. While the driving position is good, tall front passengers will find their head rubbing the roofthough that can be fixed to an extent by adjusting the electric front seats. Then the front legroom also comes at a premium. The rear passengers, though, get ample space all around, but long journeys can be tiring for rear passengers because under-thigh support is not as good as we expected. The GLA is loaded with almost every feature you will want from a luxury crossoverthe futuristic Comand infotainment system, reverse parking camera, GPS navigation, tyre-pressure monitoring sensors, attention assist you name it. And because it is a Mercedes, you just cannot find fault with the fit and finish of the cabin. The boot space, at 421 litres, is substantial and usable, and the luggage loading height is quite low and, thus, convenient. Again, because it is a Mercedes, the GLA doesnt compromise on safetyyou get seven airbags, anti-skid regulation (ASR), anti-lock brakes (ABS) and brake assist system (BAS), hill assist and more. Mercedes Benz GLA Class comes with a 7G-DCT transmission system that enables faster gear shifting. Mercedes Benz GLA Class specifications for the engine are fantastic as well with the SUV using the 2143 cc displacement garnering 4-cylinder in-line motor. Mercedes Benz GLA Class gives 138 PS power and 300 Nm torque, which are phenomenal figures.The GLA-Class diesel is powered by a 2.2 litre common rail turbocharged engine developing 135PS of peak power between 3,600 – 4,400 rpm and 300Nm of max torque between 1,600 – 3000 rpm. The petrol fueled GLA-Class is powered by a 2.0 litre unit developing 183PS of maximum power @ 5,500 rpm and peak torque of 300Nm between 1,200 rpm and 1,400 rpm. 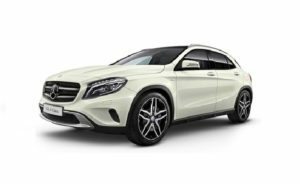 Mercedes Benz GLA Class mileage is 17.9 kmpl, which is something that will please most customers, allowing them to gain much more distance for a decent amount of fuel.The Mercedes-Benz GLA 200 CDI has an ARAI rated fuel efficiency figure of 17.9 km/l. The Mercedes-Benz GLA 200 has an ARAI rated fuel efficiency figure of 13.8 km/l. Mercedes-Benz organised this drive on the winding roads of Himachal Pradesh where we were able to judge its riding manners, to an extent, while also having fun with the car. Large 18-inch wheels and 235/50 size tyres give the GLA a lot of stability. Yes, there is some amount of body roll especially when you go on a curve at high speeds, but the body roll is containedwe did some sharp cornering manoeuvres with the GLA and the car felt safe most times. When we took the car on a riverbed we found on our way to Shimla, the 183 mm ground clearancebest in classensured nothing scrapes the bottom. In fact, even though the GLA is powered only by the front wheels, it handled muddy tracks with a remarkable ease. The electro-mechanical power steering means there is ample steering-feel and a relatively tight turning radius ensures parking is not much of a bother. Mercedes Benz GLA Class has a strong safety system with the presence of adaptive brake lights flashing, attention assist, LED headlamps, hill start assist and many other features. Mercedes Benz GLA Class comes with Electronic Stability Program (ESP) as well that reduces the chances to over steer and over turn.The Mercedes-Benz GLA-Class has very neutral handling traits that make it a very safe car to drive. You can also exploit the true potential of the suspension around tight bends in a very safe manner. The disc brakes all around offer great bite. The GLA may not yet be as entertaining to drive as the X1 and not as good off-the-road as the Q3, but what it gets is upmarket looks and a novelty factor. When the GLA is launched on Tuesday, September 30, all ears will be on how much it is priced. We expect Mercedes-Benz to keep the starting prices close to the psychological figure of R30 lakh (remember, it is only a front-wheel-drive model right now, and a more expensive all-wheel-drive version may enter the showrooms later this year). At that price, the GLA-Class can be Mercedes-Benzs sweetest deal this year.